The old clock tower is striking midnight! 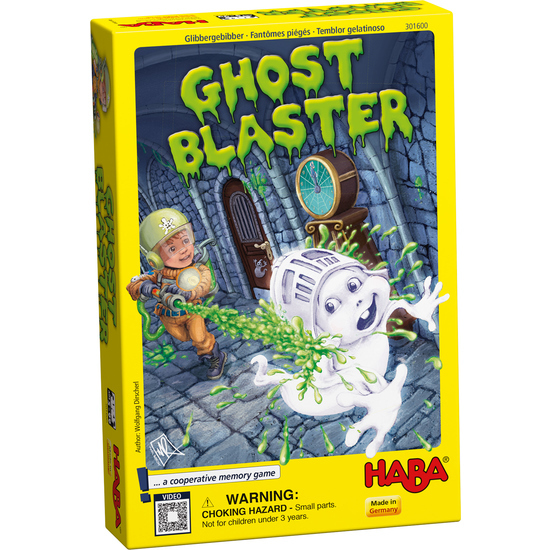 The three ghost hunters quickly reload their green goo ammunition in their handmade power pistols and enter the castle. Will these three manage to blast the spooky ghosts with the right amount of goo and capture them before the ghost hour is over? Be careful! If the ghost hunters fall into a trap, it's off to the dungeon for them! Contents: 3 ghost hunters, 24 cards (18 ghost cards, 3 dungeon cards, 2 keyhole cards, 1 castle door card), 1 clock (= rotary disc), 18 goo missiles, 1 die, 1 game instructions.